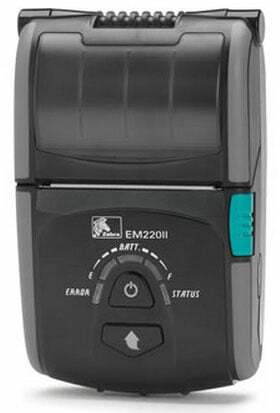 Zebra EM220II - MFi Certified, MSR, Bluetooth, USB, Serial Interfaces. Includes Hand Strap, Battery, and Charger.Works with Apple iOS (iPad, iPhone, iPod). Compact and affordable mobile receipt printing for use with your smartphone or tablet device. Accept payment and print receipts on the go from Zebra"s EM220II mobile printer using the latest smartphone and tablet devices. The EM220II offers 802.11b/g wireless LAN capability for secure connections to existing networks and supports Bluetooth 3.0 connectivity to all mobile device platforms including Apple iOS, Android, Windows Mobile and BlackBerry. Quickly and easily swipe credit cards, print 2-inch-wide receipts, and keep your customers happy with this lightweight, simple to operate mobile printer. The Zebra W2B-0UB10010-00 is also known as ZEB-W2B-0UB10010-00	or W2B0UB1001000	.